If you've ever seen "What Dreams May Come” with Robin Williams and Annabella Sciorra, you know it's a beautiful and extravagant movie that won the 1998 Oscar for Visual Effects. But as easy as this great flick is on the eyes, it is the story that grabs your heart and refuses to let go. So what does this movie have to do with airplanes? Great question…read on. The movie’s premise is based on Robin’s own perception of what his heaven would look like after he dies in a car crash scene and is reunited with family that has preceded him in death. It is a living, moving Van Gogh painting, with masterfully illuminated, digitally created vistas that stretch to the edge of every frame. Watching it took me to a place I have been often, a place I call my own Airplane Heaven. If the premise of the film is to be embraced, then we create our heaven in the image we imagine in our thoughts. 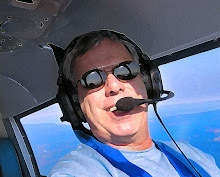 I have experienced my own Airplane Heaven often, starting soon after my dad died in 1991. I have been there so many times now, the scene is etched in my mind forever. 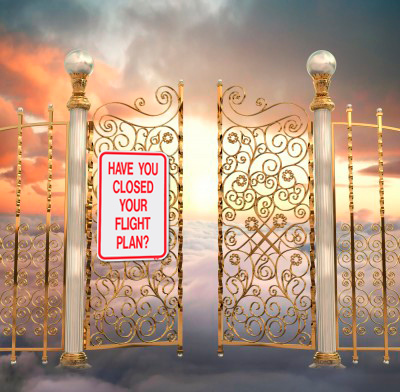 In my Airplane Heaven, there are no Pearly gates or rivers of wine and endless tables of gourmet food, as some have suggested greet the chosen in the popular view of the storybook version of heaven. But there is an automatic gate that’s opened by keying in a series of secret numbers known only to those who are lucky enough to visit my magical place. And that river of wine…is actually an assortment of imported beer – mostly Guiness Stout and Kaliber – and the food is a combination of t-bone steaks, tacos, $100 hamburgers, organic greens and cheesecake. Those Brats the guys and gals are eating over at my never-ending Hangar Party are TWO FEET LONG, cooked on a grill so big it makes Johnsonville’s “World’s Largest Grill” look like a freakin’ hibachi. In my Airplane Heaven, the ramp is filled with one flyable version of every airplane ever made. All are in perfect condition, gleaming under a crystal clear blue sky, keys in the ignition and the tanks full of fuel – which by the way flows freely from wells stretching to the horizon. Since this is my Heaven, I hold type ratings for everything ever made, and I get to spend my days throughout eternity making the daily decision about which of these many airplanes I get to fly today. Maybe I'll pull out the 787 or loop a few loops in Wayne Handley's Turbo Raven...the choices are truly endless. In my Airplane Heaven, everyone is there enjoying the airport. There’s Papa Louie in his new HondaJet…and is that Art Scholl in the right seat? 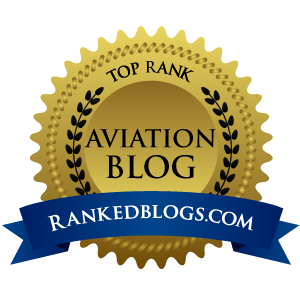 I suspect Art and Dad are going up again to see just how far upside down they can get that HondaJet today. Oh what, you didn't think an HA-420 was certified for aerobatics? Dude, what part of Airplane Heaven don't you GET? And at the Airport Café (which has a tanker truck of Eugene’s luscious Café Pecori coffee out back) we find Lindbergh, sitting with Amelia and Noonan, talking navigation, no doubt. Lindy is toying with Amelia, showing her a new Garmin 796, just to screw with her head...he's like that you now, always the jokester. And check out the crowd over at Jimmy Doolittle’s hangar, gathered around his solid gold B-25. There's a juke box playing music from the 40s, and a barrel of coins next to it so the dancing never ends. Yes, friends, if the premise of “What Dreams May Come” is to be believed, then this IS my Airplane Heaven. Only in the movie, they also visit hell, which is about as nasty as you might imagine. But what, you might be asking, is my vision of Airplane Hell? Strangely at first glance, it appears identical to my Airplane Heaven. There before you stretch endless rows of perfectly airworthy airplanes, keys resting in the ignition. The WX is clear and a million, and you’ve got nothing to do all day but fly…after all, you’re dead, so your Daytimer is wide open. Only one major difference…in my Airplane Hell, there is no gas. Not a drop of Avgas or Jet A to be found. All that hardware is there only to torment your soul as you stand helpless on a blistering hot ramp, awash in pity as you loathe your future, which could not possibly be less bleak. A licensed pilot could not dream up a scenario any more horrible, when off the horizon comes a low rumbling noise. The noise becomes louder, and as the skies darken with the wings of a thousand airplanes blocking out the sun, your hell becomes unbearable as all the guys from over the hill in my Airplane Heaven buzz you, one after the other, all grinning. Yes, our world is what our thoughts make it. You can choose to live in a dark world filled with broken dreams, anger, and unsatisfied resolutions, or push on courageously to new and glorious heights. I choose to push on – in the words of Buzz Lightyear – to infinity, and beyond!